I have thousands of files. In fact, I am one of those that praises the lack of viruses aimed towards Mac’s. Yet l feel as though my sheer number of files are an un-organizing virus that multiplies exponentially with no signs of slowing down. For example the hundreds upon hundreds of files named DSC03243.jpeg, courtesy of my voracious appetite for taking pictures. I’ve rat packed hundreds of bookmarks, dozens of text documents, and a few thousand mp3’s for starters. I’m trying to manage all of this using an interface created well over 20 years ago, when computers had a whopping 128kb of memory. The idea back then was a basic principal: create a computing environment that is analogous to my desk. Well my desk is a mess, it always has been, and now my desktop is becoming mockingly similar. The truth is, no matter how many folders and subfolders I create, I am never diligent enough to keep things organized. Everything gets dumped on my desktop, periodically the confusion gets stashed into a folder I create on my desktop called “STUFF”, or “unsorted”, or some other variance on this theme. The desktop has become outdated and unyielding in today’s world of 160 GB HD’s and “shoot till your fingers bleed” digital cameras. 1. Spotlight: Much has been said since Apple introduced us to the Spotlight technology built into OS 10.4. These comments have ranged from bellows of “copycat”, to effusive praise. I’m not going dig into the controversy stirred by the similarities between Spotlight and programs like Quicksilver and LaunchBar. I have used both programs myself, and liked them, but there is nothing quite like a search built into the core of your OS. Spotlight, simply put, is like having thousands of tendrils spread throughout your HD latched onto and peeking into every single file, folder, or application you have. 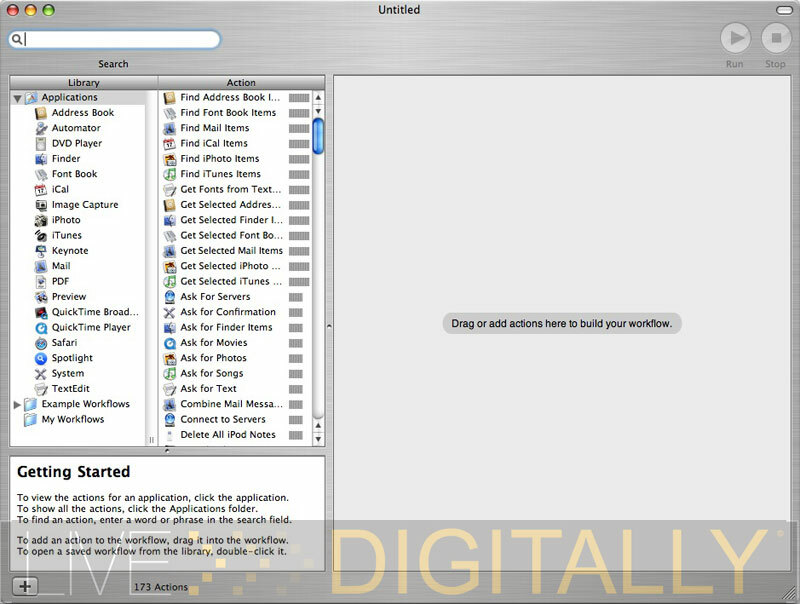 Spotlight creates and index of the your entire HD (you can narrow what it accesses via the system preferences) that is instantly searchable from anywhere in the operating system regardless of what you’re doing via hot-key, or by clicking the spotlight icon in the top right menu. 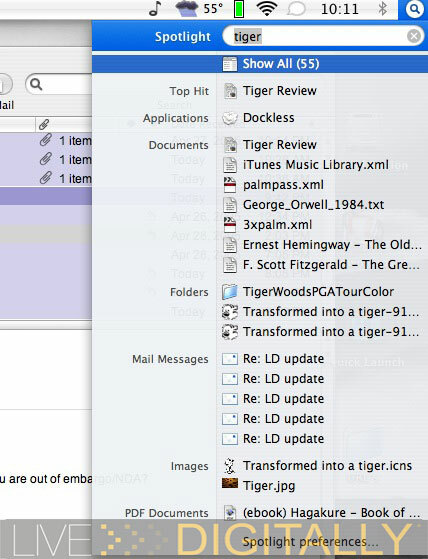 Spotlight searches not only through file names and folders, but within the text of an actual document be it pdf, email, calendar event, or address book contact, etc. It is the first truly intelligent search built into an operating system I have ever seen. The aptly named spotlight does just that, it brings all the items matching your criteria into the spotlight. It’s remarkable, by this technology being built into the OS means that is that it’s always on. Hell, if you right click on any word irregardless of where that word lies it allows the option of an instant Spotlight search for that term. Third party applications can also benefit from it, and many have current announced plans to do just that. 2. Dashboard: Another feature of Tiger, blatantly similar to the Konfabulator program, holds the number two spot in my opinion. Dashboard is like a corkboard, with pushpins that hold small but practical applications that you can access at a moments notice. In technical talk, Dashboard is a small java runtime environment that is always on yet uses very little of the systems resources to do so. I hate math, and always cringe at having to do anything further than a most basic calculations in my head. Yet I almost never use the calculator program build into OS X 10.3 Panther. Why, you ask? I have to navigate to my applications folder, find the calculator program, launch it, and finally use it for a two second calculation. Far too much hassle on my part, and the idea of keeping it on my dock seemed to be a waste of dock space. Now calculator is a Dashboard widget, that flies onto my screen at the ease of a button touch, and is hidden away just as a fast. Widgets are mini applications that are run in this new Dashboard. Along with calculator, I have dictionary, weather, translator, sticky notes, wikipedia, and a slew of other useful widgets at my finger tips. What makes this tool so powerful is the idea that java is such a common programming language, there are already a slew of 3rd party widgets, most free, available for download. 3. Automator: In short this is applescripts for laymen. For long version fanatics, Automator allows you to string together a series of commands and tasks to create a savable automated sequence, for use again and again. Think resizing a batch of pictures, and automatically emailing them to your GF. Automator automates this action to a simple touch of a button. The program is a bit less than intuitive, but with a little effort it can be an effective tool. Most importantly, you can download pre-created Automator scripts from apple’s website. 4. Smart Folders: These allow you to create folders that will add any file that fits the criteria you assign. The idea here is forecast searching. For example, you create a folder with the mindset that it will contain all files related to the word “Apple”. 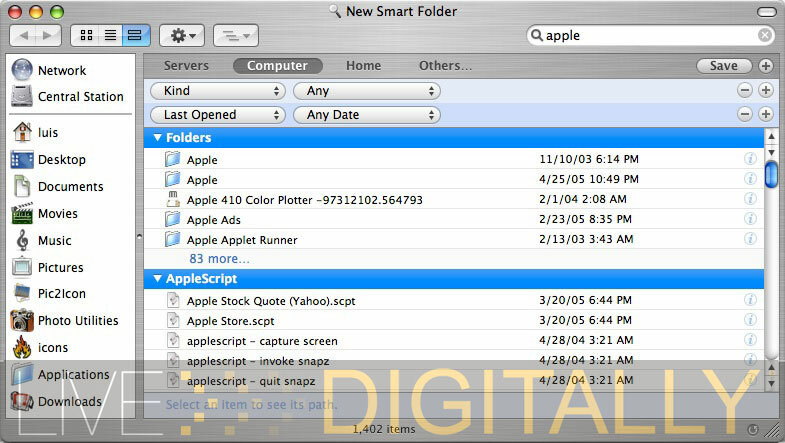 With a Smart Folder, you assign the term “Apple”, and each file on your computer with that word in it will be added to the folder. This is a real time update, so as you add or delete files containing “Apple”, your folder will recognize this and do the same. 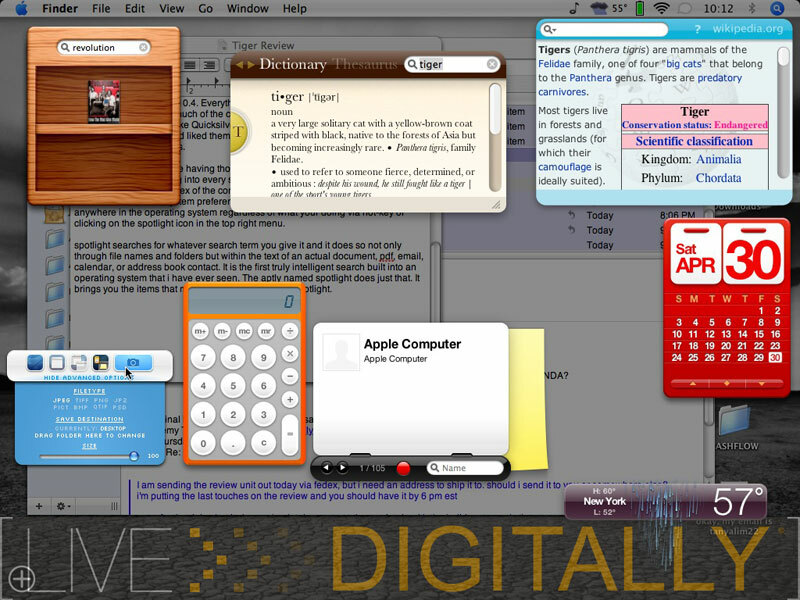 There are a slew of other features in Tiger including an updated version of iChat, Mail, and Safari, all with many notable features. iChat adds the ability to conference video chat with three other people and as up to ten people in an audio conference. Mail sports and new look, and the inclusion of Smart Folders and Spotlight technology. Safari now has a built in RSS reader, and the ability to do private browsing, which essential disables cookies and the history. All in all this is a an update that does more for bringing computing into the 21st century than anything else I have seen. Organizing my digital clutter still requires some work from me, such as naming my picture files something useful, but with Tiger I feel the OS is working with, me and not against me.